December 31, 2018 admin Uncategorized Comments Off on Welcome! 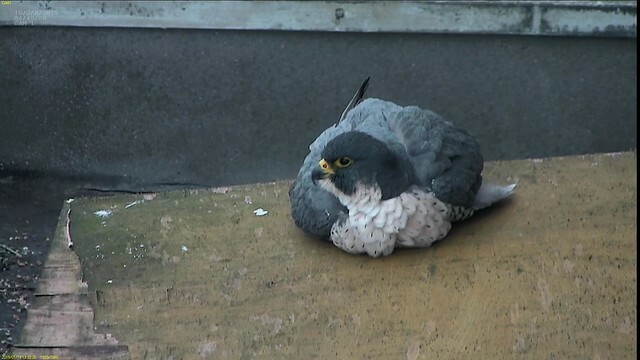 This site is dedicated to the Peregrine Falcons who decided to make their home and hunting grounds in Fulham and Barnes (as well as Hammersmith) in West London, UK. 2 days ago I finished reading New Girl’s ring, that involved a lot of patience and luck but little by little I managed to piece it all together. I immediately submitted the number to Euring (https://euring.org/) and got an email back from the BTO this evening. It turns out that I watched (and probably a few of you too) her grow up on a RSPB webcam and then I saw her take some of her first flights! She is no spring chicken, she was born in 2010 in Vauxhall, London, from the Parliament pair. What did she do in those nearly 9 years? We’ll never know as it doesn’t look like her ring was reported in those years. 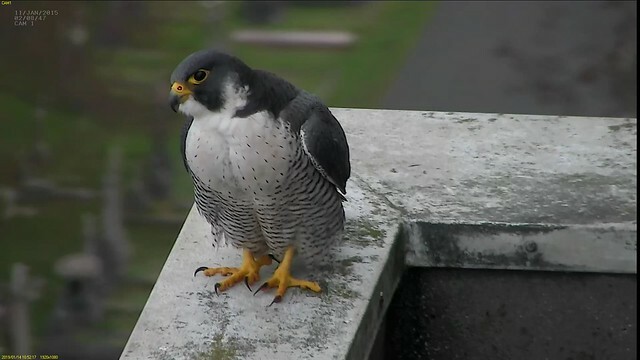 And for those of you following the Nottingham Peregrines, it means she’s Archie’s big sister! So, she is one of the 4 young on the first shot, at the nest site, could be one of the 2 on the second, and is in one of the circles on the 3rd shot, at Parliament. I have been asked a few times already about a name for New Girl. Obviously, that name is good for now but wouldn’t quite fit if she’s around for years. I have given it some thought over the weekend. Charlie was named Charlie as I wanted a name that could be both male and female and I based it on *Char*ing Cross Hospital. I couldn’t think of a name for her first mate and ended up calling him Mr C, which suited him very well. Tom’s name is based on the initials of The Other Male. I have had a suggestion of Violet (because she screams a lot) but she doesn’t feel like a Violet to me, she is a BIG girl. What do you think? T&D? Tom finally got his wish on Saturday when she joined him for a courtship display inside the nest box 🙂 He was so excited, bouncing all over the nest box, as she appeared on the wall by the nest box before jumping inside the box 🙂 She usually stays put where she is and doesn’t really join in. Tom paid one of his night visits on Saturday, arriving and going inside the nest box at 3.38am and staying there until 4.51am. 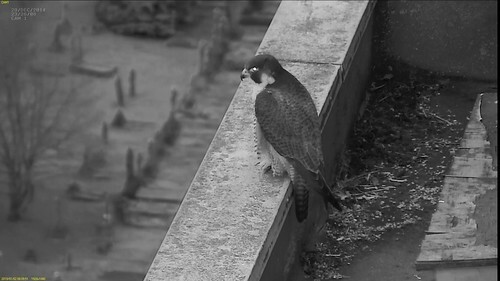 Talking of night time, New Girl has been roosting on the ledge both nights but she gets fidgety at times and moves around a bit. She even spent a bit of time on top of the nest box. 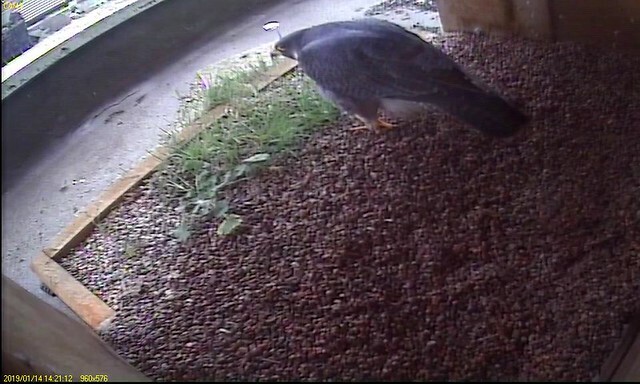 She has been staying on the nest box a bit during the day as well. I spent a couple of hours on Saturday watching her and Tom. She disappeared from sight and we were wondering where she’d gone. Turns out she’d gone onto the nest box and we couldn’t see her from the old FledgeWatch spot. Another distinguishing feature is some rather prominent ‘whiskers’. 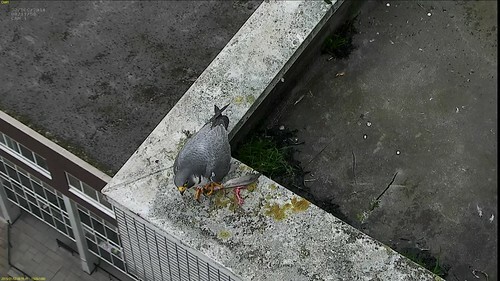 Tom has kept her very well fed with a good stream of Feral Pigeons. New Girl quickly figured out the location of the ledge cache. She roosted on the ledge and spent pretty much the whole day there too, she is definitely seeing it as home now I think. It’s day 3 for New Girl at the hospital and she spent the whole night roosting on the ledge. It looks like she’s set to do the same again tonight. Interestingly, she’s using the exact same spot as Charlie, against the wall. 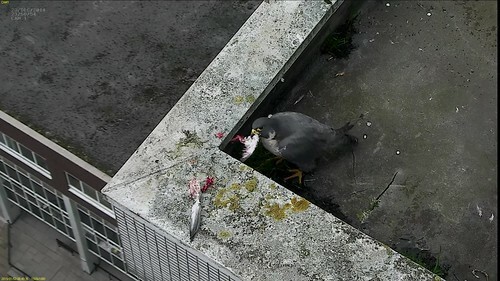 He brought her a feral Pigeon which she ate for about an hour before putting the rest in the larder on the ledge. They mated on the ledge for the first time at 3:30pm. She still has blood on the feathers on her right legs and she appears to be injured on her left bottom eyelid which gives her a bit of a funny look. Was that there before or is it a result of the fight…? Look wise, she looks a lot more like Tom, her chest is white like him not honey like Charlie’s and her cheek patches go a lot higher than Charlie. I was walking from Hammersmith shortly before that and could see two Peregrines fighting over the skies around the Ark and Novotel. 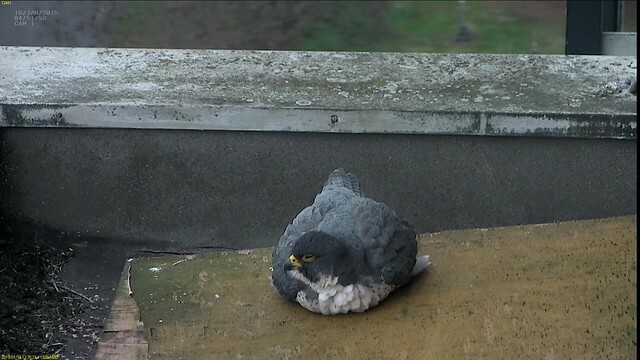 When I got to the hospital I could see 2 Peregrines on the hospital and 2 Peregrines up in the air. Unfortunately the sun shining right over the hospital prevented me to see much of what was happening and prevented me from taking any meaningful photos. It was enough for me to see that Tom was perched on the North Wing corner. There was a bird on the wall over the ledge but I couldn’t make out who it was, that bird was being dive bombed by one of the birds in the air. 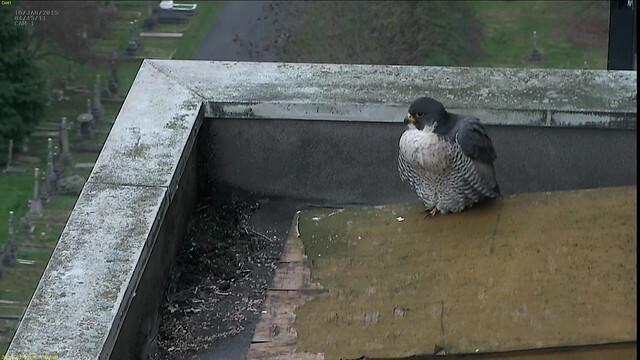 Then, there was a bird on the ledge, it went onto the ledge, the recording told me later that it was Charlie. She was there screaming for a couple of minutes then she took off and went around the North Wing and that’s the last I have seen of her. 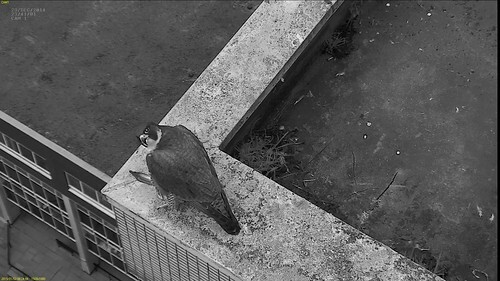 Tom turned up on the ledge late afternoon with food, no one turned up, I started to wonder if something was wrong, but, occasionally, Charlie hasn’t heard Tom so he had to go and find her, it could be that. She has blood on her right leg, I suspect from the fight with Charlie. Since yesterday morning, she has been spending a fair amount of time on the ledge. Tom has brought her food which she has accepted. 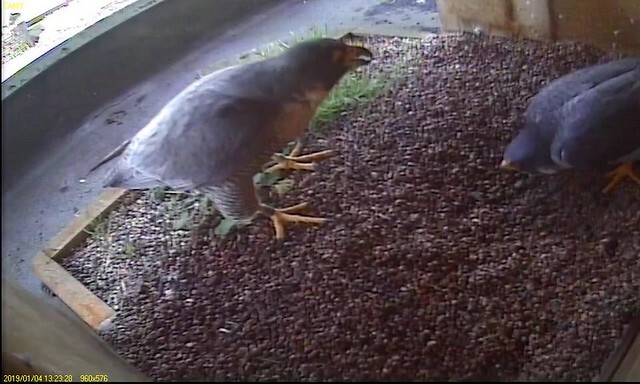 Tom has tried to entice her inside the nest box for a courtship display, she is happy to join in but from outside. I have seen them fly together and this morning they chased an intruder together. That intruder could have been Charlie, unfortunately the action was a bit too far for me to make out individual birds. Early afternoon on Saturday 19th January Charlie arrived on the ledge and after a short while decided to pancake on the wall of the ledge. I find the following video interesting as it shows her settling, with a better angle than when she does this on top of the nest box as she tends to face the camera there. She pancaked for a few minutes but got up quite quickly and moved to perch on top of the nest box instead. There, she decided to pancake again and even have a bit of a snooze. Tom paid 2 visits to the nest ledge today. 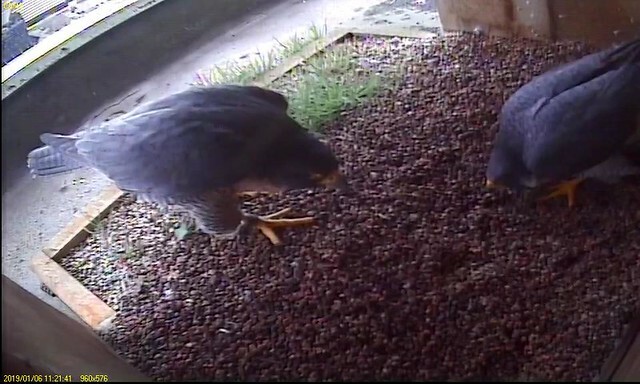 Tom and Charlie have managed to do 2 ‘proper’ courtship displays inside the nest box since the last post. The season is properly started! 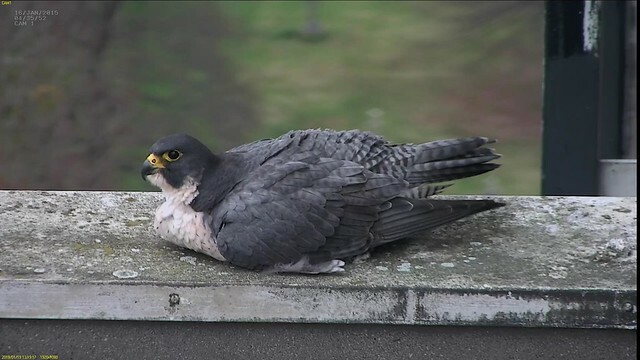 No visit to the nest ledge today but I saw Charlie perched on the usual perch and, this evening, she was on one of her roosting flues, as most days. A couple of attempts at courtship displays today. 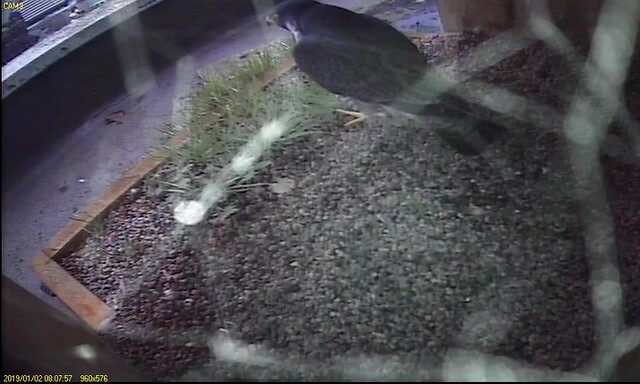 It all started early, before the cameras had switched back from night setting, with Tom landing on the nest ledge, followed by Charlie. Tom went to the nest box. But Charlie preferred to eat. 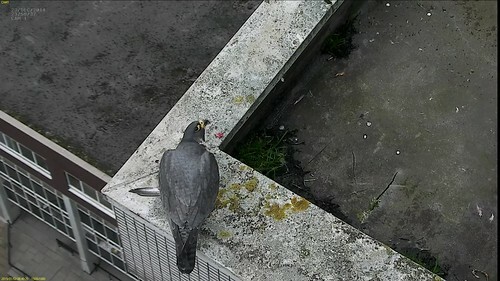 After she’d finished eating, Charlie went to cache the remains in their usual spot on the ledge, feaked for a bit and was sitting when Tom decided to go in the nest box and tried to entice her for a display. But, it looks like she wasn’t interested. So he finished the remains instead. Later in the afternoon, I was walking through the cemetery, when I heard Peregrine calls and saw Tom land on the corner of the nest box. 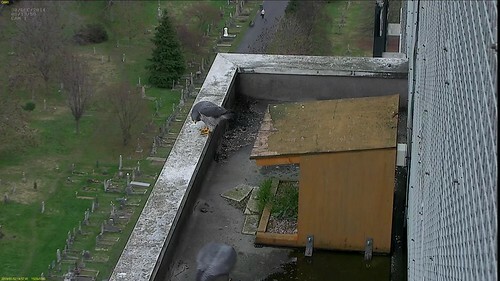 A minute later I saw Charlie arrive from the South, circle a bit and then land on the ledge at the other end. Tom immediately went into the box but Charlie took her time and by the time she got to the nest box Tom had gone on the wall. Much quieter day today. Morning excitement was the appearance of two red kites or perhaps it was just the same one appearing twice within an hour. Also Stuart from LPP went over to Lewisham from Sutton to do yet another successful rescue before returning to help with our watch. This evening a large prey was brought in but held back for about an hour. All the juveniles had a good feed from it during a half hour or so. The best news is that all six birds were seen at the same time around 8 pm. What a day - two juveniles successfully rescued from blocks of flats still under construction. Then tonight we had all four juveniles eating prey at virtually the same time. Two of them were still being fed by an adult and the other two were plucking and eating other prey brought in. 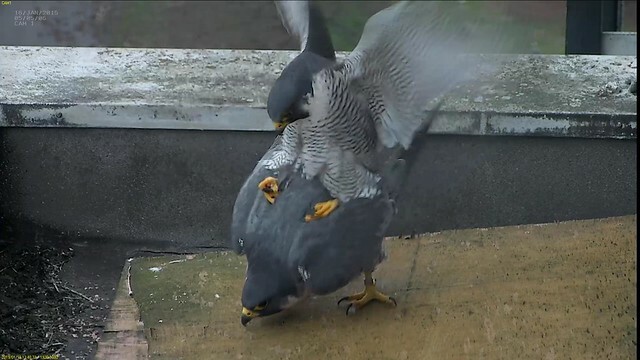 It is the first time all four juveniles have been seen on the top ledge and what a wonderful sight it was after the events of earlier in the day.